Who is City Voices Chorus? 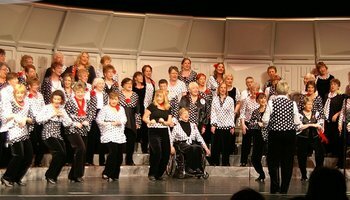 City Voices Chorus is made up of women of all ages and walks of life. There are accountants, teachers, full-time homemakers, doctors, journalists, students – interesting women who are interested in you. Our membership includes trained music professionals and "shower" singers, in high, medium and low voice ranges (four parts, remember!). We rehearse every Thursday evening at 7:15 p.m. at Church of the Good Shepherd, 1166 So Mason Rd, St, Louis, MO. Want City Voices Chorus to sing at your next function? Why not hire us to entertain at your next event? We can perform at corporate functions, charity events, community Entertainment events, birthday parties, christmas parties, awards nights, weddings, engagements, anniversaries, engagements, and even funerals and memorial services.